A close friend asked if I'd make peacock cookies for her daughter's sixth birthday. Normally she's not too shabby when it comes to making sugar cookies - however she didn't want to attempt these. So it fell to me. To make them. And to make them look good. A hard feat. Feathers are just difficult. So I started with a seashell and oval/teardrop cutter. Everything you'd use to make peacocks right? The ovals would become the feathers. Then I just put colors on top of colors. The peacocks were just an experiment in the making. Which actually means I had no clue what I was doing and was flying by the seat of my pants. I'll say that it ended up working pretty nicely...though the peacocks seem to have a surprised look on their faces! Maybe because they're so shocked that it worked. I didn't take any pictures of the number 6's I did...they were actually a surprise for the birthday girl and her mommy. So that's the reason I'm using for not taking photos...and I'm sticking to it. I'm fairly happy with the way everything turned out. I still want another go at the feathers. But I think we'll have a pretty happy six year old. A very very Happy Birthday to Miss Riley! We hope these live up to all your peacock wishes! 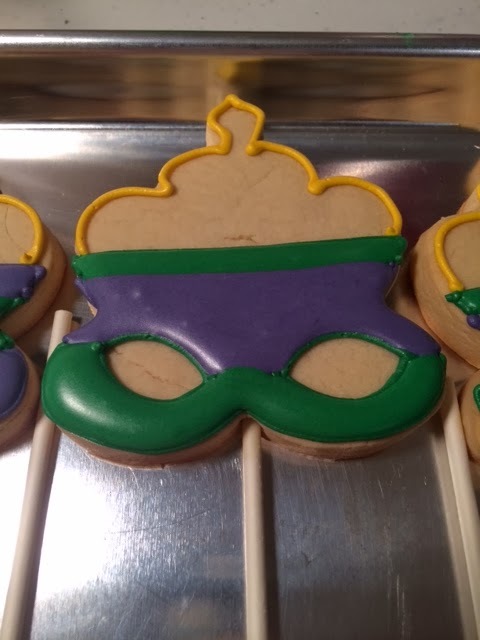 ...but making Mardi Gras cookies are just as fun! Forget the beads and floats...I'll stick with Mardi Gras masks. I started with two cookie cutters combined to make one large mask. A crown and bikini top! Doesn't it go hand and hand with Mardi Gras. Combined they made a rather fine mask. Now, let me back up. You may be wondering why I was making these Mardi Gras masks. I was asked to make them for someone who wanted to use them as props for a photo shoot. 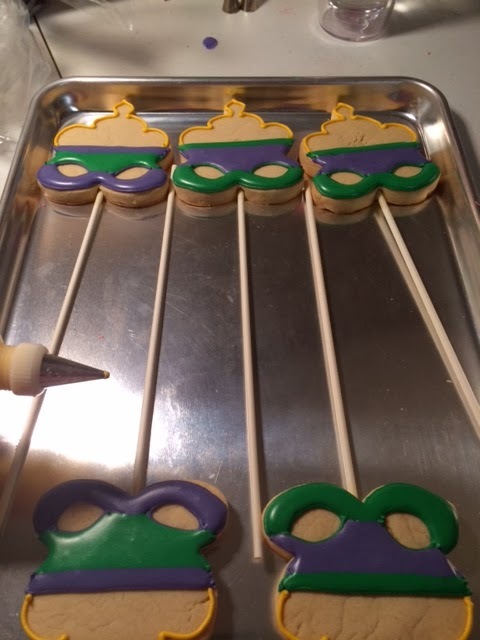 So they also needed to be on sticks - and incredibly sturdy - since the cookies would be picked up repeatedly. I'd hate for them to fall off in the middle of a photo shoot! I'm not going to lie. These were hard. Not only making sure they were sturdy yet "pretty." 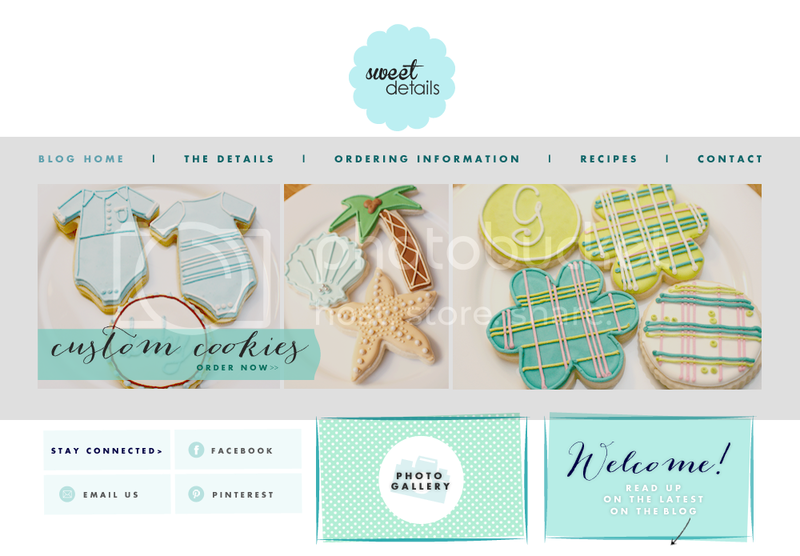 Sticking to the red, green and purple theme seemed best, not to mention the client asked for that! So here's where I leave you with the photos - I wasn't good again at taking actions shots - bad Annie. The and stuff part speaks to the Hello Kitty cookies. Technically they were for a little girl to take to school for her Valentines party but Hello Kitty isn't just regulated to the Valentine's holiday, she's an all occasion kind of cat. She started out plain, but all good Hello Kitty's need a solid white background before they can go out into society. It'd be like going out without your makeup on and that's just plain crazy. Then I added in a red eye. It's the start of her bow. The center to be exact. God bless Sugarbelle and her tutorials or this would have turn out way worse. And here's where you close your eyes and imagine what it would look like if I had taken pictures of the next few decorating steps. Keep those ideas in mind and then look at the final picture. Good imagination on your part huh? However, don't fret. Because boy do I have lots o'pictures of the other "standard" valentines cookies I made. I mean it's not Valentine's Day without a heart right? Funny story. I had posted the finished picture of the heart above on my Facebook page. And my mother, who is out of town, posted that "you should make those." Ummm...I did. Silly mom. I'll let her off the hook - she's in Mexico on vacation so maybe their Internet is different down there. #itsnotdifferentbuti'mtryingtobenice. So back to more heart pictures. I made these too mom. So there you have it. Cookies. For Valentine's Day.